This autumn, Sewanee welcomes two new language professors: Michael Wairungu and Sara Nimis. The pair join the burgeoning International and Global Studies program on campus and bring with them unique prospects for the future of language and cultural studies at Sewanee. Hailing originally from Kenya, Michael Wairungu joins Sewanee after completing his Ph.D at the University of Virginia. Prior to that, Wairungu earned a bachelor’s in education in Kenya where he also taught Swahili to high school pupils. He later went on to teach Swahili as a Fulbright Scholar at Stanford University where he developed an interest in linguistic anthropology which he went on to pursue at the University of Virginia. He worked as a curriculum designer and specialist of Swahili at Diplomatic Language Services, LLC in Arlington, Va. Wairungu developed a Swahili curriculum for the U.S Navy Seals. Professor Wairungu joins Sewanee as a Mellon Globalization Forum Post-Doctoral Fellow in Swahili. Sewanee Purple: You are a professor of linguistics. What are your particular intellectual interests? Wairungu: During my studies I became interested in Sheng, which is a mixed language consisting of English, Swahili, and linguistic elements from several other local languages. It is used primarily by youth as a form of counterculture. When I was a high school teacher in Kenya, I used to condemn the use of Sheng but I came to be interested in it. I have found that languages do not spoil each other, they instead enrich each other. In one of my articles, The Rise of Sheng: A Sociolinguistic Revolution from Below, I look at Sheng as a tool for nonviolent protest. The graffiti of Sheng that I observed was mostly about criticizing teachers and parents. You’ll also find students using Sheng during academic discussions. They use Sheng as an intermediary language, i.e., to discuss and decipher concepts that they find difficult to understand when said in English or Standard Swahili. SP: What do you hope to accomplish here at Sewanee? W: I am planning to use my two years here at Sewanee to conduct further research about the penetration of Sheng into different social categories of people. One, is the use of Sheng among Kenyan youth living in diaspora. Secondly, I want to study conservative religious groups in Kenya. I’m interested in seeing how Sheng, which figures of authority in Kenya associate with “bad” people, is used and viewed by members of such groups. I also plan to settle down and start a family and I’m hoping that after these two years, Sewanee will retain me. I see that Sewanee has a strong quest for languages…I think Swahili has a future here. SP: What can students expect from you and what do you expect from students? W: I want them to see in me a big brother who is willing to make time and with them and hold intelligent and meaningful discussions. I hope to be a true academic and social resource to my students. Outside of academics, I enjoy long-distance running and within this setting I expect to interact with the students in ways that will forge relationships. From the students I expect hard work, a quest for knowledge, and respect. SP: Do you have any closing remarks? W: Dream and dream big. The world has the capacity to provide what you want and that world is Sewanee. Originally from Ohio, Sarah Nimis taught as an adjunct professor in the Department of Comparative Religion at Miami University of Ohio. She earned her Ph.D from Georgetown University. She spent five and a half years in Egypt conducting field research and a year in Qatar teaching Arabic to international students. 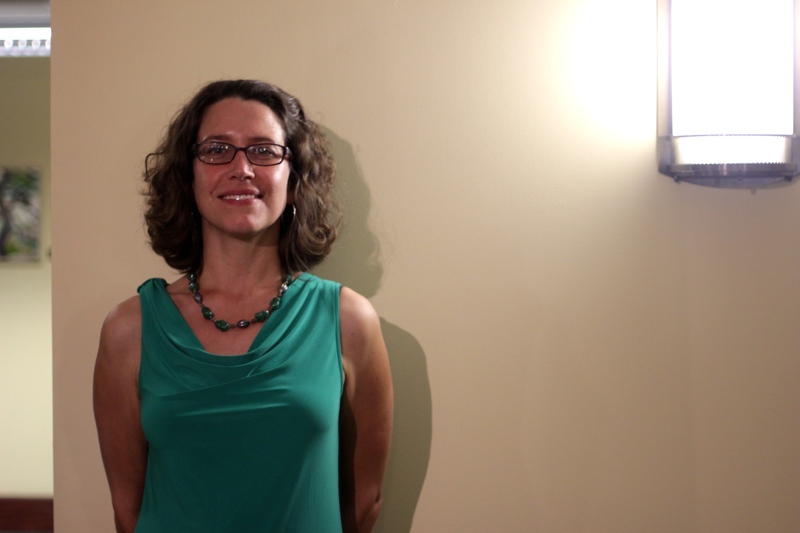 She joins Sewanee as a Mellon Globalization Forum Post-Doctoral Fellow in Arabic. SP: You are an Arabic professor who spent five years studying abroad in Egypt. What was the focus of your interest? Nimis: My research dealt with 18th century Sufism in Egypt. I studied the way that the Sufi brotherhoods were involved in the political and economic structure of the society in Cairo. I used mostly documentary sources there… so I went to a lot of libraries, archives, and booksellers. The whole process was a lot of fun. Currently I’m in the process of turning that into a book. SP: Currently what are your primary areas of interest? What interests do you see yourself pursuing in the future? N: One of the things that’s intriguing to me about Sewanee is the Environmental Studies program and the way in which it’s linked to research in the humanities. I’m hoping that I will have some interesting exchanges with the religion and environment program and enjoy some interesting cross-pollination. I’ve always been committed to leading a sustainable lifestyle and I think here [at Sewanee] I can envision a way of incorporating that into my professional life as well. SP: What can students expect from you and what do you expect in return from other students? N: I expect my students to show up and to make an effort. What they can expect from me is a lot of support in whatever they want to do. I’m interested in their opinions and I am ready to learn from them. So far, I’ve been very impressed with the students in my class. They speak up and put forward interesting ideas. N: The Mellon Globalization Forum is a wonderful opportunity because it gives me time to work on my own projects and creates an atmosphere where I can be creative. I want to take advantage of that and hopefully get some research done. One project that I would love to do at some point, is to go back to Egypt and digitize collections of old manuscripts that people store in their homes. SP: Do you have any closing statements you want to make? N: I’m delighted to be here at Sewanee; it’s a great place. Already, Wairungu and Nimis have begun teaching their first courses at Sewanee: African Youth Cultures in Post-Colonial Africa (INGS 201) and Islam and the West (INGS 202). These new additions to the Sewanee faculty represent a significant contribution to Sewanee’s fledgling International and Global Studies program. They will not only expand the Sewanee’s repertoire of language offerings but will bring with them unique cultural, historical, and anthropological expertise.